There is nothing left to say about our captain and for most of his career our inspiration. Gerrard is a one club player joining Liverpool at the age of nine and has been at the club ever since, he signed his first professional contract on 5th November 1997, before making his debut just over a year later on 29th November 1998 in a Premier League match against Blackburn Rovers making a total of thirteen appearances in his debut season deputising for the then captain Jamie Redknapp who was injured. Gerrard played more regularly partnering Redknapp in the 1999/2000 season before he was beset by injuries, suffering back problems and having to have several operations on a problematic groin. He recovered from these injuries and cemented his place in the team in the 200/01 season claiming his first trophies with Liverpool that season winning the FA Cup, the League Cuo and the UEFA Cup that year and later the Charity Shield and the UEFA Super Cup. 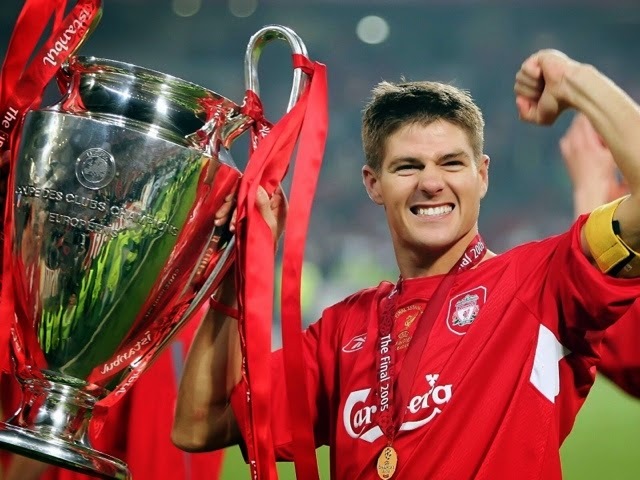 In 2002 Gerrard was made vice captain of the club and remained in that role for about a year before he replaced Sami Hyypia as club captain in October 2003, he has remained as our captain ever since one of the longest serving captains in club history. Twice in 2003 and 2005 Gerrard was tempted to leave Liverpool, with Chelsea turning his head on both occasions, in 2005 soon after victory in the Champions League final negotiations over a new contract appeared to break down and Liverpool Chief Executive Rick Parry conceded that the club had lost Gerrard, saying "now we have to move on, we have done our best, but he has made it clear he wants to go and I think it looks pretty final" the very next day a new four year contract was signed and Liverpool had their talisman back. In 2006 Gerrard was named PFA Player of the year as well as scoring twice in the FA Cup final win over West Ham making Gerrard the first player to score in the final of the FA Cup, the League Cup, the UEFA Cup and the Champions League. In 2009 he was named as the Football Writers Association Footballer of the Year. At the time of writing Gerrard has notched up an incredible 672 games and 174 goals for the club, not a bad total for an aggressive box to box midfielder. Gerrard has been at the top of his game for what seems like ever, there is a generation of Liverpool supporters who have never know life without Gerrard and the rest of us are fearing the time we have to be without him. It's to his credit that for many years we were considered a one man team, especially when you think of the names that have played alongside him. He has scored goals in vital games and at vital times, he is widely regarded as the inspiration behind our incredible if unlikely Champions League win in 2005 and repeated the trick in the FA Cup final the next season. When he eventually hangs up his boots he will be remembered alongside the true greats of the club, he is a true legend.